Can a Spouse Appear in Court on Her Spouse's Behalf? Marriage is a legal contract between spouses. Married couples can automatically do certain things for one another, such as making emergency medical decisions and overseeing burial arrangements. Special inheritance and property rights are also incidental to marriage. Married individuals do, however, maintain the vast majority of their individual legal rights. Therefore, spouses do not have inherent authority to appear in court proceedings on behalf of their husbands or wives. A person must have a law license and be a member of a state bar association in order to represent people in legal matters. Practicing law includes such activities as drafting legal documents and appearing for people in court. Representing a spouse in court is not an incidental right of marriage. Generally, it is illegal for a non-lawyer to represent her spouse in court because it is considered the unauthorized practice of law and may result in up to a year in jail and varying fines based on state laws. 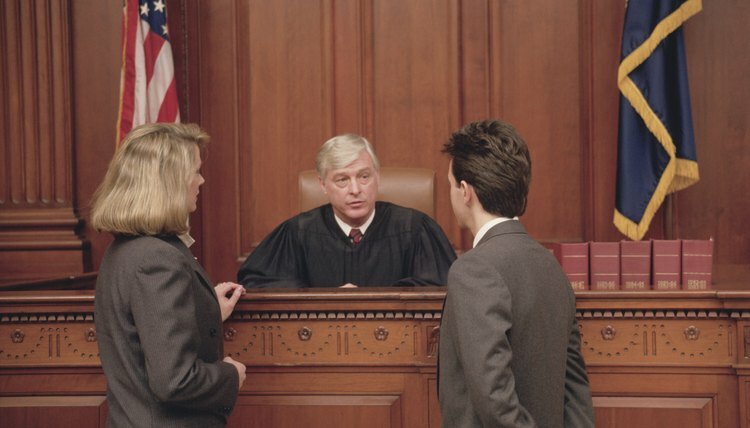 A person who is married to an attorney may have her spouse appear in court for her. There is no prohibition against an attorney representing his spouse in litigation. Therefore, a spouse may appear in court for his wife if he is licensed to practice law and is a member of the state's bar association. Some states allow individuals to appear in small claims court cases for their spouses. Small claims courts do not allow parties to bring attorneys. They are designed to resolve small disputes between private parties. Generally, such appearances are limited to cases where spouses share a joint interest in the dispute. A husband or wife must also consent to their spouse appearing for them. A small claims judge or magistrate always has power to require both spouses to appear if she believes it is in the best interests of justice. In cases where spouses may appear for their husbands or wives, consideration should be given to any potential conflicts of interest. For example, a husband and wife sign a contract to paint their home. The painter and the husband later change the paint color to something the wife does not like. After completion, if the spouses are sued jointly for non-payment, the husband may be held liable since he consented to the change. However, the wife may not be liable if her basis for non-payment is that she did not agree to the change. California Department of Consumer Affairs: What Is Small Claims Court? State Bar of Michigan: Unauthorized Practice of Law.